The City Fix blog reports on another survey conducted in the relevant corridor between April 30 to May 5, 2008. City Fix also links to a pdf report on the survey. EMBARQ's graphical summary of the key survey findings, as reported by CSE. The survey also found little support for scrapping the corridor. The survey was done by the Centre for Science and Environment (CSE) jointly with Delhi Greens and the Indian Youth Climate Network (IYCN). I remain intensely curious to see a careful evaluation of this project. 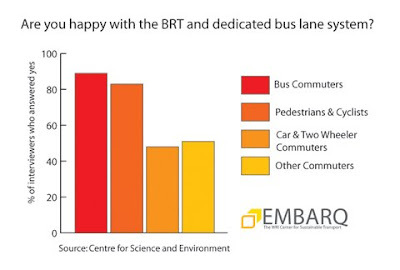 Whatever the results of such an evaluation, it does seem clear that much of India's media have misrepresented public opinion of the BRT in Delhi. (By the way, this is not a BRT blog or a Delhi blog! But Delhi's BRT has been a hot topic lately. Here are some of my earlier posts on this issue).